Can be installed by one person in minimum time. Fits many motors - provides high attenuation per dollar. 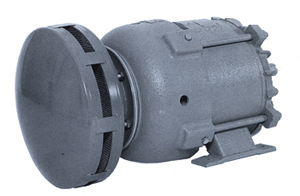 Specifically designed to quiet circulating air noises created by fan cooled motors. Many TFFC motors produce noise levels of 95 dBA or more. A proven performer in hundreds of installations, the IMM can reduce this noise well below acceptable levels. When superior aeroacoustic performance is required, the Type TMM Motor Mute (Figure 1) can meet the challenge. 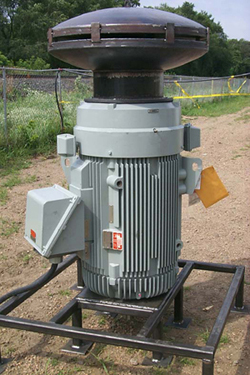 Typical noise reduction of a 150HP electric motor is from 98 dBA sound power to 66 dBA sound power. 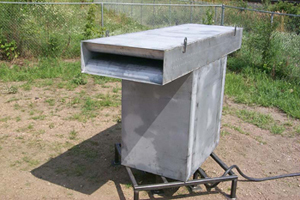 IMM-36 (Figure 2) Motor Mute Silencer undergoing free field acoustic testing on a 150HP electric motor. When a modest acoustic criteria is specified, the IMM motor mute is an economical and convenient tool for silencing the inlet air. Motor drives must be considered when designating system acoustic performance.